Huh, yeah, I was just noticing this the other day when pointing some via the contact form to a couple scripts for something they were curious about. Had assumed it was a burp rather than an ongoing thing. If there's a good easy way to host a copy of mefi-specific scripts on the wiki, that seems like a great idea, yeah. Thanks, yes! I was just trying to install a mefi-related script yesterday, and found out that the site is apparently down for the count. What is the deal with that place? Thanks for the news. I also noticed that some scripts (specifically the awesome metafilter scroll tag) only work with http urls and not https urls. If you're a script developer and are reading this, please support both http and https! cortex: "If there's a good easy way to host a copy of mefi-specific scripts on the wiki, that seems like a great idea, yeah." As someone who makes heavy use of greasemonkey scripts on mefi (not to mention a handful of userstyles with Stylish), I cannot support this strongly enough. I'd love to see some sort of semi-official repository or collection point for these scripts (that hopefully fosters the authors to keep them updated and working well with one another). The situation there is so aggravating. Basically Jesse Andrews, the founder and admin, got tired of running the site in 2010 and offered to "pass the torch" in a Hacker News thread. But despite getting plenty of offers -- including the very top one from Jay "Saurik" Freeman, famed community manager of the Cydia/jailbreak scene -- he ended up retaining control of the site while simply abandoning it to have fun at some space photography startup, leaving the forums increasingly spam-ridden and basic infrastructure to rot. He's not obligated to run the thing, but just walking away from a valuable resource and community like that with no successor is incredibly irresponsible. Frustrated users have tried starting various forks and replacements, but none have the name recognition, userbase, or most importantly the script volume to match USO, whose top scripts have tens of millions of downloads. Fortunately, Archive Team has been running their archival bot on the :8080 port since the main site died, backing up script source code at a furious pace. But to what end, I'm not sure, since a lot of value came from the script reviews, forum discussions, etc. I don't know if they plan to reconstruct the entire site or what. Anyway. Very crappy situation. And the way Andrews continues to blithely tweet about SPACE CAMERAS while ignoring all pleas for help is super obnoxious. Plutor, if you are out there, please fix your Mefiquote script for FanFare! to be fair, SPACE CAMERAS. I really tried to find a contact at this site. Anyone been able to? Adding HTTPS support to Plutor's Mefiquote script just requires adding a few lines at the top. Here is a copy of the modified script. Go to "Tools" → "Greasemonkey" → "Manage User Scripts..."
Hit "Preferences" next to the Mefiquote script. Hit "Add..." Next to the "Included Pages" list. Enter "https://*.metafilter.com/*" (without the quotes) and hit OK.
cjorgensen: "I really tried to find a contact at this site. Anyone been able to?" Here's his profile on USO, and I linked to his Twitter handle above. I strongly suspect he's ignoring any site-related questions, though (if he hasn't abandoned that website/email completely). HTTPS support is not the issue with the Mefiquote script - it doesn't pull the username properly. Cortex theorized that FanFare handles usernames slightly differently than the other sites. The only difference in the markup (that I see, I might be wrong) for comments is that the div.comments that holds a FanFare comment has an id and the div.comments that holds a MeFi comment does not. This difference shouldn't make anything that worked on MeFi break on FanFare. Jpfed: "The only difference in the markup"
You see how the username of the quotee is hyperlinked. When you do it on FanFare, the username becomes: %n So, not showing the actual user. It's expecting a https, and it's no longer there. I messed around with it a bit, and I think all you have to do to make it work is replace that line with a regular expression that makes the http(s) bit optional. This probably isn't an optimal regex - if anyone better at regexes than myself wants to make it a little more elegant, go ahead. And looking back at previous Mefiquote threads, I see pb's kinda already on top of this, although I think his regex fixes FanFare, but breaks the other subsites that are still using non-relative protocol URLs. Looks like that worked, zamboni, thanks much. Make it happen! Like pastebin meets userscripts.org meets "Dr. Theopolus" from Buck Rogers, as this is Metafilter and Disco-Era television sci-fi is how we roll. Lets see the fuckers at Teh Goobles downrank that action. Does anyone who has looked into the various us.o alternatives have an opinion on where we should move our scripts to? I mean, in the immediate sense - the Metafilter wiki sounds like it might be a good, but I get the impression that it would first have to be set up to host them (or at least that it would be good to first set them up to host them). It seems like any wiki-style "anyone can edit" thing would be extremely risky, since user scripts only really work if you trust the author, or vet the scripts before installing them. A github repository sounds really cool, but I'm at a loss for how commit rights would be handled. Hey all, this is the wiki host. While the wiki can (probably) hold scripts, I'm not sure the workflow for uploading scripts or installing them is there. Would some web-accessible Github-like site on the server help? How about if the folks that wrote the scripts put them on their github pages, and linked them in this thread? We need a userscript bat signal. boo_radley, thanks for this post, and Rhaomi, thanks for the explanation. I found out about the port 8080 thing on Tuesday and was trying to figure out where to put my little MeFi greasemonkey scripts. I found that greasyfork.org (one of the alternate sites listed in the second link of this post) has an import tool to grab scripts from userscripts.org, so I tried it; the tool copied over the scripts' code correctly (you have to verify ownership of of your userscripts.org account first by adding a link to your greasyfork.org profile on your userscripts.org profile). The import process only covers the script code itself, so any additional html/text descriptions on the userscripts pages themselves need to be copy/pasted over. I also found that image paths need to be accessible via https in order to be displayed in the Description sections on greasyfork script pages. So, I'm not sure if greasyfork is the best place to host these right now, but I'm willing to give it a go...it supports versioning, and I didn't have any problems updating the scripts from its UI. In any case, for anyone interested, here are the new links for the comment hedgehog, Recent Activity rainbows, and inline video fishy icon greasemonkey scripts. If a better (or MeFi-specific) solution comes along, I'd certainly be interested in adding the scripts there, too. Recent Activity Rainbows, as well as the narwhal/unicorn buttons, make me so sad that Safari on iPad can't do Greasemonkey. If your device is jailbroken, you can buy Userscripts Loader from Cydia ($2.99) and use scripts like on a desktop. It's super cool. It would probably best to have these scripts on github, yes, where bugs can be reported etc., but that might be a pain for non-coders. So maybe a directory of some sort, more palatable to less technical users, but backed by/linking to github repos? Embiggen the Smallest Metafilter: Mouse over small text to embiggen it. Jessamyn's Star: Bring back Jessamyn's star. Screenshot. Metafilter Comment Box Logout: Add a "logout" link to the right of your username above the comment box. Screenshot. Metalinks: A sidebar of links collected from the current page's comments. Screenshot. Subdue Metafilter Titles: Makes the titles on the main pages less obtrusive (in my opinion). Screenshot. Enhance Metafilter Titles: The yin to Subdue Metafilter Titles' yang. Warning #1: If you have both installed, I think only one will work; disable or uninstall the one you don't want. Warning #2: You don't want this one. Hide That Thread: Hides a particular thread from Ask Metafilter's list. No, literally: one specific thread. You don't even have a choice which one. Oh, and: Any chance of getting Greasy Fork added to the "Also on" list in our profiles? Userscripts is there. MeFi Nope! -- adds a "nope" link to each post on the blue. Click it and the post goes away (and is replaced with an "unnope" link). Great for hiding things that you know you really don't want to click on ever ever ever. FWIW, the fix suggested by zamboni above seems to work great and is easy to implement for even a non-savvy user in Firefox. Open your add-ons manager, select "Options" for Mefiquote, then click "Edit this User Script". The line you need to replace is line 74. Save and then restart Firefox. I just recently had to reinstall Firefox and lost all my MeFi userscripts. The new link to the 8080 port on userscripts.org just throws errors all over the place. A new place to host all the MetaFilter related scripts (other than this thread, although what's here has been a huge help so far) would be fabulous. And it looks like userscripts is just dead now. Nuts. The Internet Archive has a decent backup, I think, but search won't work there. I've been thinking about how to make a better backup, and I'll work on it. There's now a static copy at userscripts-mirror.org - search and tags are currently broken. Looks like Google Chrome just disabled all of my extensions that aren't officially from the Chrome Web Store. I really don't want to move to Firefox, but I miss the MeFi extensions already. Installing them again isn't working. From a quick search, it looks like this is something Google implemented with Chrome a few months ago, so it's not just me. If anyone has suggestions, I would love to hear them. aabbbiee: If anyone has suggestions, I would love to hear them. aabbbiee: "Looks like Google Chrome just disabled all of my extensions that aren't officially from the Chrome Web Store. I really don't want to move to Firefox, but I miss the MeFi extensions already. Installing them again isn't working. If anyone has suggestions, I would love to hear them." There's an extension named Tamperfox that'll let you install userscripts. I'm moving to firefox right this very minute! Can anyone point me to where Metafilter MultiFavorited Multiwidth by Deathalicious might be hosted? And Threadwin? That Chrome change is nuts. It's fine to throw up a bunch of warnings, and require explicit permission, but to flat out forbid non-Web Store extensions? I am shocked, Shocked!, by how up-to-date and clean firefox is looking. aabbiee and anyone else on the fence, tots give it a look. Rock Steady, the comments on that are from 2012, so the info is old. I could not get Chrome to reinstall the extensions and Chrome did not recognize the flag that I added. But hooray for Tampermonkey, which does install userscripts! The MeFi Wiki still lists the userscripts.org addresses, so I was able to pull those individually from the Internet Archive and they installed. The disabled extensions are still listed in my Chrome installation, but Tampermonkey could not fix them and re-enable them. Oh, hmm. I have been able to get Chrome to load unofficial extensions, and I could have sworn those were the directions I followed. Rock Steady, they are still in the process of rolling out the new policy. So while that method of installing worked even a few days ago for me, it's now completely ineffective unless I switch to a dev build of the browser. The error has been logged to the database; you can complain in the site forum or email the admins. Sorry, the monkey that normally runs the site is busy playing with a cat. when I tried to find a script. 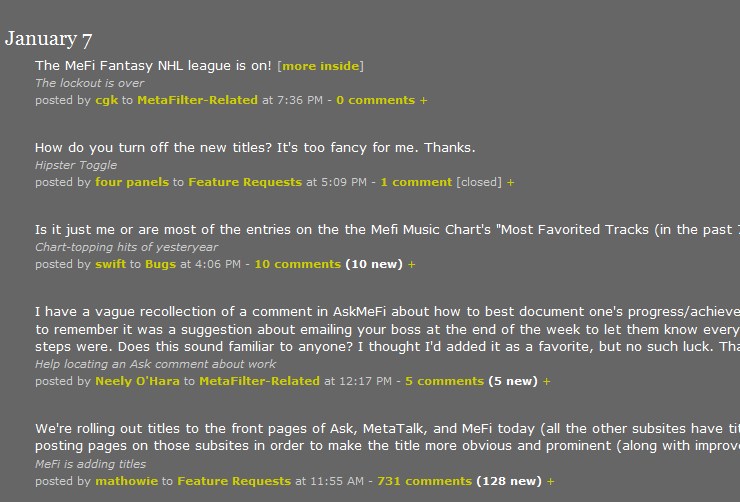 I seemed to have lost the Metafilter MultiFavorited Multiwidth extension due to Chrome's new policy. If anyone has any suggestions other than moving back to FF, do tell. Thanks. Chrome's extensions live somewhere within your appdata directory (on windows, IDK about mac or linux). You should be able to root around in it to find your extension. I encourage you to save it and post it somewhere. 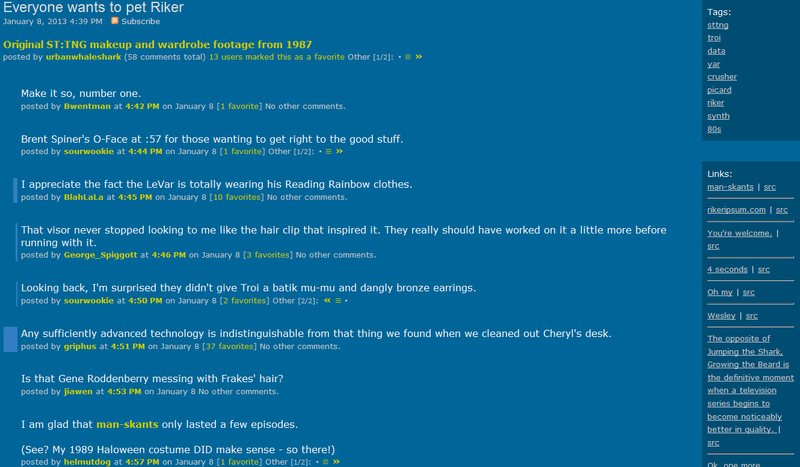 That comment has some other things that I've found useful in my Metafilter travels.